Guess what I didn't use on my toast this morning? Butter! Yes, I left the butter in the fridge and grabbed a ripe avocado off my counter and spread some of this luscious fruit on my toast. Toast with butter is heavenly (I agree) but so is avocado toast. You can avoid that "animal fat" which isn't good for your heart and you will use ZERO animal products with this snack. And, avocados have been shown to REDUCE cholesterol levels and they have a lot of fiber. Your heart will thank you - and you are making a "green choice". Actually, the nutritional bang for your calorie consumption is worth it for avocados and if you combine it with a 100% whole grain toast - you have a killer snack. It can be difficult to find an inexpensive and delicious avocado. I buy them when they are about $1 each because I have found if I pay $3 for an avocado it tastes terrible. I believe the $1 price indicates that they are in season and here that season starts in February. To keep an avocado from turning brown, just leave the pit in the avocado when you store it. I like to add a little salt or a squirt of lemon (if I have it) to my avocado toast. You can also layer a tomato or other sandwich stuff for a truly luxurious snack. Kids also seem to really love avocado on their toast. Call it "green" toast and you have an instant hit (green eggs, green ham, green toast...). What is your favorite use for avocados? Spread avocado on toast. Salt to taste and enjoy! Great Idea, but why not just drizzle olive oil and roasted tomatoes with a little bit of radish sprouts? maybe some white pepper and a dash of salt? Or even a bit of apple butter? We can make or get it year round and apple vs avocado? Just as easy to come by if not more and stores longer than the easily bruised yet very tasty avocado. Just a thought. Thanks for the simple, tasty, nutritious idea! 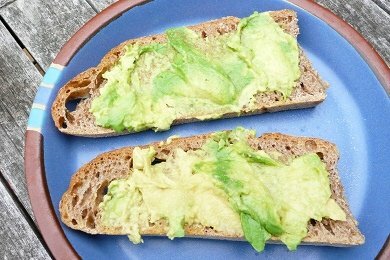 I love spreading avocado on toast. It melts a little on hot toast and is super delicious. Avocado is also great on bagels, and is a tasty alternative to cream cheese in the morning. Avo toast is one of my fave treats and a healthy source of fat. I used to get this exact thing at a cafe in our building (since closed) sometimes I'd get it as avo-bacon toast which is even better.. but for a meatless treat, you're so right! This is one of my favorites! I've been doing this for years - it's so filling and delicious! I add a sprinkle of salt and sometimes a few red pepper flakes on top - fantastic!!! I actually love to add jam on top of my avocado toast. Try it! Love avocado! I use it in place of mayo on a sandwich or wrap. Lovely idea~ I haven't been seeing any avocados in my store lately...or any at all. I must go look though! @Haywood: Not all bread is full of empty carbs. White bread is pretty much empty carbs, but a nice 100% whole grain toast/bread isn't. Besides, bread can help with the needed 48 grams of grains per day. Earth Balance is great to have on hand as well, it's vegan too. I prefer avocados, but sometimes I just don't have a ripe one around! I don't eat toast too much since I have to have special millet bread, but do love the Earth Balance. Just tried this before my run last night! Great snack and filled me up. you rock, Lisa! Snack Girl is the best blog ever! & I'm comparing it to some really neat baking blogs about cupcakes & muffins & lovingthtasmaniandevil.wordpress.com (sorry, I'm being a little silly. there is this muffin blog by a mom that uses muffins to get nutrition into her kids. Is bread vegan? doesn't it have eggs & perhaps milk too? I don't get the vegan thing... not that I'm against it. More power to ya! it just confuses me. it it like a boycott, until animals aren't treated cruelly anymore...? 'cause that makes a little sense I guess. I love to spread a tablespoon of avocado with a tablespoon of reduced fat cream cheese on my toast! So delicious and filling.